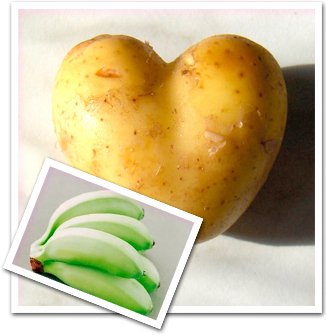 Resistant Starch – Who Knew? Resistant starches are a weight loss TRICK that really works. These starches contribute in many ways to weight loss and over all digestive health. What are they? Beans, peas, lentils, potatoes, yams, nuts and seeds, unripe bananas and whole grains such as barley and brown rice are all resistant starches and will help you lose weight. Starch consists of molecules of glucose linked to each other forming amylose and amylopectin. Amylopectin molecules have a branched shape and fit together loosely, which makes them easier to digest. Amylose molecules fit together tightly and form granules that are much harder to digest. Most plant food is made up of 20-25% amylose, but resistant starches contain much more amylose (60-80%) than amylopectin, so they are resistant to digestion. Normally your body digests starches in your stomach and small intestine, turning them to glucose (blood sugar) to fuel your body and store the excess as fat. When you eat resistant starches, however, they digest differently, passing through the stomach and small intestine and settling in the large intestine. There they ferment, helping in several different ways. One: They create beneficial short chain fatty acids including butyrate that help promote weight loss by increasing the amount of stored and just consumed fat your body burns and reducing blood sugar and insulin levels. Two: They protect the lining of your colon by decreasing ph, which boosts calcium absorption and blocks absorption of cancer causing substances. Three: They help the growth of healthy bacteria (probiotics) which gives your immune system a boost. Four: They prompt your body to produce more of the hormones that signal satiety and fullness, so you feel full sooner and eat less! How do you benefit the most from eating these foods? Cooking these starches breaks them down somewhat (gelatinization), making them easier to digest; cooling them thoroughly before you eat them gives the starch a chance to harden into a crystallized form (retrogradation) that is harder for the body to digest. So eat these foods cooked then cooled! Posted in Body, Brain, Dieting, Food, Habits, Health, Nutrition, Psychology, Research and tagged amylopectin, amylose, starch, trick on May 5, 2015 by tiffany.